While talking about Dental health, the maximum focus is likely to be on preventing cavities. But least do many of us understand the importance of having healthy gums. Gums play a significant role not only in having better oral health but in well-being in totality. Bleeding gums and swollen gums are a sign of gum diseases in many instances. However, there are many other reasons for gum problems. Swollen gums is a problem that occurs as a result of poor oral hygiene. It is commonly called gingival swelling which causes gum inflammation, irritation, sensitivity, and pain. Bleeding also is more frequent while brushing or flossing. Gingivitis: Gingivitis is the most common reason for swollen gums. 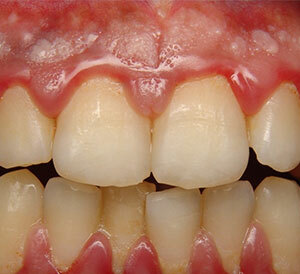 Many people don’t realise that they have gingivitis because the symptoms are usually mild. However, if gingivitis is not treated properly at the right time, it can lead to “periodontitis” which can result in tooth loss. Gingivitis is commonly the result of poor oral hygiene, which allows plaque to form on the teeth and the gum line. Tartar accumulation can lead to gingivitis.Plaque is a bacterial film that forms due to food deposited on the teeth over a period. Plaque can turn into a harder bacterial coating called tartar if it is not cleaned properly regularly. You may require a dental professional to help you remove, and clean tartar to avoid further infection from spreading. Pregnancy: Pregnancy is a phase when all the hormones fluctuate, and there is a constant change in the entire body. The rush of hormones during pregnancy increase the blood flow in the gums which causes irritation in the gums and swelling as a result. These hormonal fluctuations can also reduce the body’s ability to fight against the bacteria that cause gum infections. Malnutrition: Deficiency of essential nutrients, especially vitamins B and C, play a significant role in causing gum swelling. Vitamin C provides maintenance and repair of the teeth and gums. If the levels of vitamin C drop too low, it could lead to scurvy. Scurvy causes severe gum diseases. Infection: Fungi and viral infections cause swollen gums. Herpes virus can lead to a serious condition called acute herpetic gingivostomatitis. This causes inflammation and swelling of the gums. Thrush is another result of increased growth in naturally occurring yeast in the mouth, which also causes severe gum swelling.